A couple of weeks ago I finished reading “Woodcraft and camping” by George Washington Sears. The book was first published in 1920, and is an instructional book on outdoor life, with described trips from 19th century North America. The book can be downloaded for free as an ebook at Gutenberg. In many aspects it feels like it could have been written today. The author describes the need to get out in the wild to de-stress, how fewer people have to do more in shorter time, and describes burn-outs as a result of an ever increasing work load. This as early as in the beginning of 20th century. The book describes how one can enjoy themselves a lot more with a lighter pack and lighter shoes, and that the outdoor magazines try to sell you a lot of stuff that you don’t need, and that might only make the trip into the wild a misery because of the weight. He describes in the book that his own base weight never exceeds 26lb (~12kg), and that includes a canoe. He did however have a custom made canoe. It’s an interesting book, but it’s far from “leave not trace”. The weight is kept down from making shelters by cutting down trees, long fires, fishing and hunting. All aspects of it might not be applicable today, but it is an interesting read, and much of the lightweight principles can be applied. In some aspects it reminds me of today, with the author buying expensive “cottage gear” to get the best custom made lightweight gear, to the amusement of his friend. A big part of the book is about fly fishing, but since I’m not that interested in fishing, I only glanced through those pages. A thing that’s a bit sad is how he describes how much land and wilderness that has been destroyed in the name of development, in his lifetime already. He writes a detailed trip report and ends it with how the forest he described is now gone. It’s an interesting book, and I recommend it. If not for actual instructions, but for trip reports and history of hiking. When it comes to pack weight there are certain labels depending on how much the base weight of your pack is. Lightweight (5-10 kg), ultralight (3-5 kg), super ultralight (1,5-3 kg) and extremely super duper ultralight (sub-1,5 kg). I guess my base weight falls in the category Lightweight. So what does it mean and why does it matter? To me, it’s not important to get below a certain weight level for the sake of it. So what if I don’t get to call myself an ultralight hiker because my base weight is 6,5kg and not below 5kg. But I still don’t think that the weight limits and labels are useless. The weight limits can serve as a way to show that gear that keeps you warm, dry and well fed doesn’t have to weigh more than that. You don’t have to reach below a certain weight for the sake of it, but you can use the weights as a guide when you plan your gear purchases. Of course you have to make sure that the gear you have is sufficient for the conditions you plan to use them in. It’s only natural that your base weight is higher if the conditions are are tougher and colder. To me, the goal with my gear choices is to be comfortable. Comfortable while hiking and comfortable in camp. Having a low base weight is not a goal. It’s means to an end. The goal is to be comfortable, and a low weight helps me keep the hiking part comfortable. But having a too low weight would impact on the comfort of the camping part. 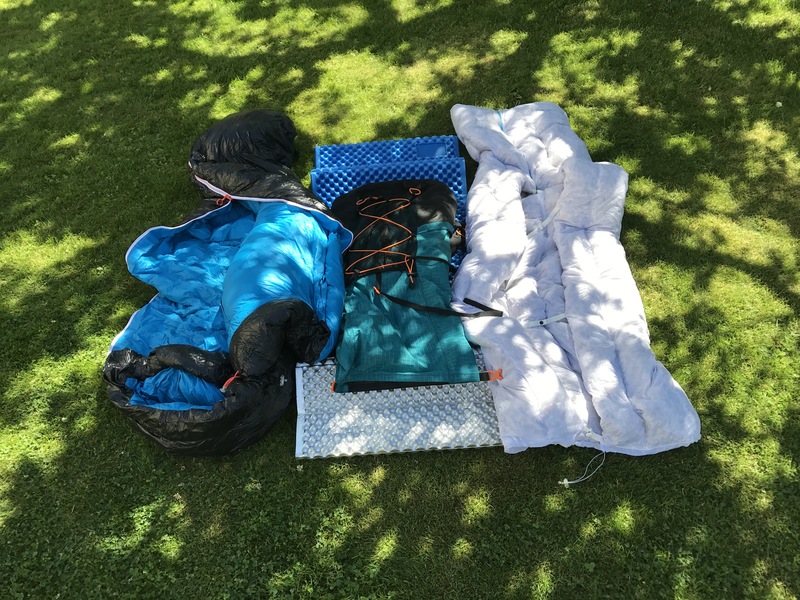 I like to have a spacious tent, warm food and coffee, a sleeping bag or quilt that’s rated a little warmer than the expected temperatures and a thick inflatable sleeping mat. This is where you have to find the perfect balance with that works for you. Different people have different comfort levels. Some like to have a thermos and a camping chair, or bring a Murrika, and some sleep with a to-thin quilt in full clothing under a poncho-tarp, and go stoveless. I guess everyone have to find out what works for them. But I do think that everyone benefits by, at least to some degree, minding the weight. If you like to bring a cast iron frying pan when you go hiking, then bring it. But let it be an active choice, not just something you bring out of old habits without really knowing why. And if you keep the rest of your gear as light as possible for your needs, it won’t break your back. My experience with the regular outdoor stores in Sweden is that they don’t focus that much on weight. They sell what they’ve always sold, and ultralight backpacking isn’t that big of thing here. But there are lot’s of smaller gear makers that you could buy lightweight gear from without breaking the bank. Cumulus and Roberts are two polish sleeping bag manufacturers that produce high quality gear at a descent price. Luxe Outdoor makes cheap lightweight tents, and I do recommend their Sil Hex Peak. And then there are all the cottage makers that many people have never heard of. Locus Gear, Hyperlite Mountain Gear, ZPacks, Mountain Laurel Designs, Six Moon Designs, Superior Wilderness Design, Tarptent and Enlightened Equipment to name a few. Some of these will break your bank though 😀. Here’s another list of a lot of cottage gear makers.